South African patriots, as well as human rights activists throughout the world, should be very concerned about the abuse of the word “Apartheid” and the excessive comparison of the South African dark page in history to conflicts and problems elsewhere in the world. While comparisons and analogies are necessary tools for understanding phenomena and problems and choosing the right way to deal with them, they are too often abused for propagandist purposes. In fact, this is why Jews are shocked when the Holocaust is compared with other events in history or recent time. Most Jews (and many non-Jews as well) regard such a comparison as taboo, because even in cases where it is justified to a certain extent, and perhaps even useful for stopping a tragedy, it is still likely to herald a future abuse of the memory of the Holocaust and its victims (who, by the way, include many non-Jews as well). The main victim of the abusive use of the word “Apartheid” is currently Israel, mainly due to the efficiency of the Palestinian campaign groups in Europe. This situation is hardly new. In 1975, Arab countries were able to pass a strangely phrased resolution at the UN General Assembly, arguing that “Zionism is a form of racism”. The General Assembly did not term other nationalist movements “racist”, which begs the question, if Quebec nationalism, for example, is okay, let alone Palestinian nationalism, why not Zionism? And how should one settle this resolution with GA resolution 181, which implies Zionism is legitimate and welcomed? I suppose erring is human – In 1991 the General Assembly revoked the 1975 resolution. By the way, the GA never declared Bolshevism as a form of racism or oppression. I wonder why. Time goes by, and the term “racism” became too banal due to overuse. When the adjective “racist” is used to describe even a person who prefers feeding only white street-cats on his porch, it is hardly surprising that campaigners look for another word with stronger impact. But how this affects the way we view Apartheid in South Africa’s history and our ability to learn the lesson? Sadly, it means that we are going to become indifferent to this word, treating it as another buzz word of political mouthpieces. Talking about Apartheid, it might be useful to shed light on some common errors. I found some of these reading an article by Leila Farsakh on Le Monde Diplomatique. Apartheid is not about “colonialists” versus “indigenous peoples”. It is about profound racial discrimination and segregation. If the French Government decided to segregate and discriminate Muslim Algerian immigrants in the same manner dark-skin people were discriminated in South Africa, would it not be Apartheid? To continue the first point above, dark-skin and white-skin peoples arrived in South Africa more-or-less at the same time in history. The former came via land from the north, the latter came by ships from the south. The Arab population of Israel/Palestine cannot be called “indigenous”, because many of its members are descendants of immigrants from other parts of the Middle East. Of course the Arab culture and ethnicity has been part of this country from ancient time, but so has the Jewish culture and ethnicity, and even to a greater extent. The population of Israel/Palestine was indeed very small when the Zionist movement started advocating for a Jewish homeland. It was not empty of course, but it was not very populated either. Furthermore, most of the initial Zionist territorial demands were rejected, first when the 1917 Balfour Declaration was limited to a territory of approx. 27 thousand sq km, then when it was further limited to about 55% of this territory in 1947. Eventually Israel was recognized on land stretching on approximately 21 thousand sq km. The reason for these limitation was indeed the fact that the local Arab community has its rights too, including the right for self-determination. One cannot judge an action or a policy unless considering the circumstances surrounding it. I don’t know about the specific circumstances in South Africa, but I do know that Arabs regarded themselves as enemies of Israel and Zionism. Arab Palestinian leaders went as far as developing deep relations with the Nazi-Germany and about 20 years later declared that “armed struggle” was the only way to “liberate Palestine”. Strong suspiciousness toward Arabs in general is an extremely sad, yet hard-to-evade, consequence. However, when the late Egyptian President, Anwar A-Sadat, took a noble courageous step and talked with the Israeli People from the Knesset’s podium, Israel was washed with wave of tolerance and even enthusiasm toward the Egyptian and Arab culture, and Israeli citizens were willing to accept almost all of the Egyptian demands. (…) I came to realize that those who argue of Israel as a regime of apartheid – even if they have a good argument, and I do not believe so – still do not have sufficient evidence, based on the reality and facts on the ground in Israel. Among the weirdest arguments against Israel I heard of Israel granting its Arab population a different marked passport than the one granted to Israeli Jews. Moreover, it has been argued that a regime of segregation exists in Israel public transportation, public educational institutes etc. Such arguments only prove that the presenters of Israel as a regime of apartheid lack the basic knowledge of what have been taking place in reality. ‘Resolutions in the Ontario Legislature send a message. 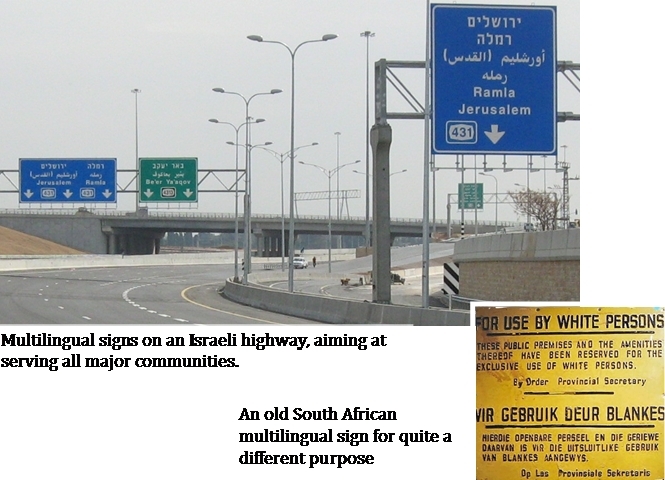 They are about moral suasion,’ said [MPP Peter] Shurman, adding ‘it is close to hate speech’ to liken democratic Israel to apartheid-era South Africa. (…) Of course, certain Israeli politicians have spewed venom at Palestinians, as have some Arab leaders towards Jews, but Israel is far more complex – and diverse – than slogans about the occupation would suggest. In a state practising apartheid, would Arab Muslim legislators wield veto power over anything? At only 20per cent of the population, would Arabs even be eligible for election if they squirmed under the thumb of apartheid? Would an apartheid state extend voting rights to women and thepoor in local elections, which Israel didfor the first time in the history of Palestinian Arabs?